Manufacturer that uses marine grade aluminum with locking mechanism to provide protection from thieves, vandals and accidents. R-9 polyisocyanurate insulation provides frost protection. A slab mounted heater provides freeze protection to both the pipes inside the industrial shelter and the riser pipes beneath the slab. There are almost limitless size options and Safe-T-Cover carries standard models from 9" x 26" x 25" to 90" x 174" x 90" with significantly larger custom enclosures built. All enclosures come in four colors for free with more than 30 other options available for a price. The panel design makes these industrial enclosures easy to customize from from size and color to climate control to cutouts and additions. The most popular fiberglass enclosure manufacturer was bought by a larger corporation in the past ten years. Like Kleenex® or Coke®, their brand name is often used instead of the general term "heated enclosure." They still make both fiberglass and some aluminum enclosures with a locking mechanism provides protection from thieves, vandals and accidents. Spray foam insulation provides frost protection and a wall mounted heater can provide freeze protection to the pipes inside the box. You can find standard models from 20" x 6.5" x 22" to 83" x 26" x 55" which come in beige. While fiberglass is able to withstand caustic conditions, fiberglass covers are susceptible to fiber bloom and cracking because of UV rays. Additionally, the spray foam insulation may break off over time or during shipping. Since these are molded pieces, custom sizes are more difficult to manufacture as are cutouts or removable panels. 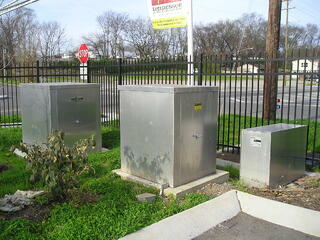 In larger sizes, hot box enclosures are comparable in price to Safe-T-Cover enclosures. 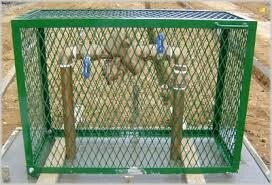 There are many companies that make cages for backflow preventers and other equipment. They come in a variety of sizes, and you do have the option of ordering a custom size. Backflow preventer cages have been in the market for decades. They are most popular in warm climates such as Southern California. These have no insulation at all to provide frost or freeze protection, but do provide some vandal, accident and thief protection as they are powder coated steel and do include a locking mechanism. They became popular when the housing market crashed in 2008 and metal theft went on the rise. These cages were advertised as the cheapest most dependable solution to this theft. Unfortunately, they are often only protected with a cheap lock and since the theif can actually see what they are looking for, are less likely to deter theft than a solid enclosure. Cages used to be a less expensive alternative, but are now about the same price as an aluminum enclosure. Manufacturers that focus on fake rocks often make a variety of products that are used together to achieve proper protection. They may offer fake rocks or plastic enclosures along with insulated bags. The R-13 thermal insulation of one of their bags provides frost protection to the pipes within the bag, but there is no thief or vandal protection. The bags come in a few sizes from 24" x 24" to 60" x 60" and come in green, blue, and tan. Since they are only for insulation, they are often sold with a fake rock or plastic enclosure. 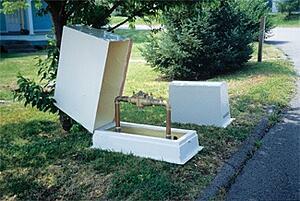 Both fake rocks and plastic enclosures are mainly for smaller equipment such as a 2" or smaller backflow preventer. 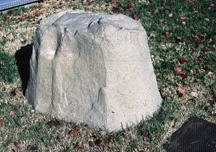 Fake rocks are primarily for aesthetics and most do not lock or provide freeze protection on their own. A common problem with fake rocks is that the interior tapers, and often customers will find their device will not fit inside. They must measure all parts of the device and know the dimensions throughout the entire enclosure to get the correct fit. The rocks are available in varying shades of grey, tan, and brown.